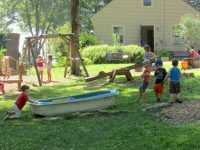 The Nature Explore Classroom at Giving Tree School is located in the hills of Western Massachusetts, where the rural surroundings provide an enriching outdoor space for preschoolers to learn through play. 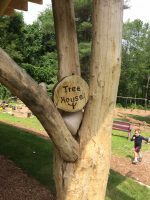 The Giving Tree Outdoor Classroom is situated on a sloped, natural landscape, bordered by conservation land, and teeming with wildlife. The land allows for bird identification, year-round environmental observations, and nature walks, while fully engaging the children with their sensory systems. Utilizing natural elements directly from our surroundings in our Outdoor Classroom has always been of high importance at Giving Tree School. We chose native plants as foliage surrounding the Swing Area, providing a natural border to the play area. The Sand Area in our Outdoor Classroom is bordered by rocks found in and around the landscape, as are the stepping rocks and wood disks in our Movement and Music Area. The Outdoor Classroom is canopied by large white pines and maple trees, providing yearlong shade. 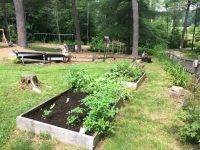 Each spring our students plant the raised garden beds with seeds and enjoy the summer harvest together at snack time. 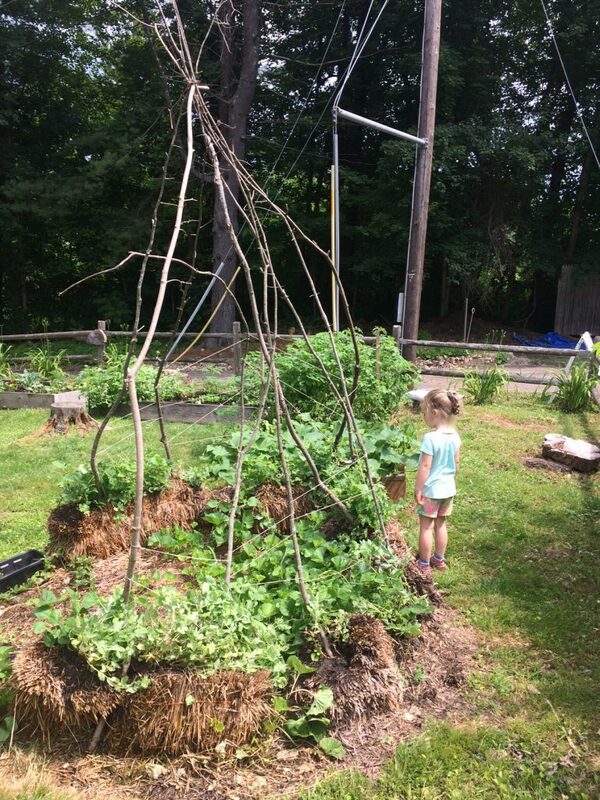 A large downed tree in the Log and Straw Area provides rich imaginative opportunities and serves as everything from train to spaceship to whale, as the children develop their gross motor skills by climbing and jumping from it. Giving Tree students explore and experiment with gravity and water as it flows from the large trough through a wooden channel down the hill to the basin. 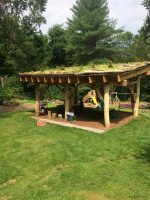 In 2017 we added the Tree House, a large shelter structure with a living roof, built in a beautiful rustic style with locally-sourced black locust whole trunks. The Tree House provides both shade and rain shelter, allowing us to maximize our outdoor time in all kinds of weather. The original outdoor structures were designed and built in 1976 by parents, a youth group, and a landscape architect. 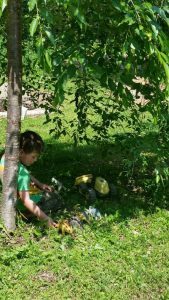 Since that time, Giving Tree School has maintained and improved the outdoor space through generous monetary donations as well as volunteer service at our bi-annual “Work Bee Days”. The school has a very active parent community. Current and past parents serve on all 7 seats of the Board of Directors, which is the governing body of the school. Events such as Work Bees, community potlucks, and Soup & Sled nights offer a variety of opportunities for community involvement, parental input, and sharing of knowledge. Families who choose Giving Tree for their children’s’ preschool experience do so in large part because of our continued commitment to providing children with ample outdoor playtime in natural environments. 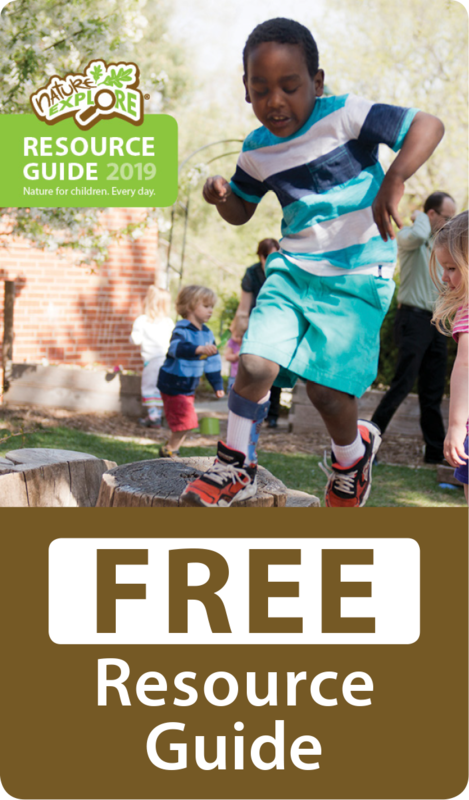 Giving Tree School is proud to partner with Nature Explore to continue our mission of nurturing young learners, providing high-quality early education, and sharing our love of the great outdoors.